For the last couple of weeks, color theory has dominated discussions between the children and myself. Little Fox is working with crayons more, where only months ago he found no pleasure in coloring or drawing. Now he can’t wait to ask about the colors to use for various projects or pictures. Meanwhile, Dragon spends hours on their art every day, starting with a sketch, then digital line art, color, and shading. Their art is becoming ever-more detailed, rich, and vivid. They’ve been learning tricks and developing skills from tutorials online, and they recently participated in the first two weeks of #MerMay on Twitter. Several times a day now, I’m asked what colors to choose. Whether for my son’s coloring projects, or my teen’s color palettes for their art, it seemed such a big enough deal that I started a Pinterest board dedicated to color palettes and color theory. When Little Fox recently worked on his wheel of months and seasons, and his wheel of the week, we talked about how colors make us feel, what colors we see or experience during different times of the day, or even the year. Some of his choices were based on what I said about a particular time of the year, but others were entirely his own. One of Dragon’s online challenges a few months ago was to use a limited palette on a piece–usually three to six–found on a Twitter thread about coloring comics for major labels. There’s a wealth of wisdom about coloring pieces with a limited palette, planned ahead of time, and it challenges artists to make choices in how they use their colors. Using this concept, I challenged Little Fox to use only five colors on a coloring page, and he loved it. He hadn’t been too keen on coloring before, but being challenged excited him. Now, he doesn’t mind using the whole box of crayons if he so decides, but occasionally, I hand him a range of colors, and he goes to town using the selection. If you want to give the same challenge to your kids (or for yourself), you can read up a bit on color theory, and either let them choose, or choose a few for them. Consider a range of five complementary colors, see how much they can do with only three, or ask them to make it monochromatic, using shades of all the same color. Blessed Solstice! Here’s a short story, offered as a gift to keep you warm this Longest Night. Free to read, appropriate for all ages. Read the rest at Flash Dash Challenge. Okra finally returned to the Redmond Farmers’ Market, thanks to a great grower named Vic. Since we live in the Pacific Northwest, fresh, local okra is rare and is usually only available two or three weeks a year. If we don’t get there early enough, it’s often sold out each weekend, so when I saw the box still nearly full last Saturday, I filled a bag of them. Last night, I made a smoky Indian eggplant and okra curry over coconut rice, which left the trimmings you see in the photo. Though our craft supplies, including all our paints, are packed away in the garage temporarily as we update areas of our house, we would normally have taken those star-shaped caps and used them for painting projects. Though it’s messy, I highly recommend okra caps for stamping and painting for summer art; especially good are the woody ones that got mixed in with their smaller, tender siblings, which you’d have to add to a slow cooker to get soft enough to eat. Just cut the tops off, leaving some of the star-shaped okra at the end, prep a palette or plate with acrylic paint colors of your choice, get out some paper and a splat mat or tarp, and start painting! The first time my daughter and I did this, she made a luscious looking multi-colored dress, and I painted a peacock with an elaborately colored tail. Using similar principles to pointillism, you can stamp-stamp-stamp your paint-covered okra caps onto the paper to create any shape or make abstract art using a blend of colors. Don’t worry if you make a mess. It’s summer, after all, just go outside and hose off. You’ll feel great and have something colorful to put up on the fridge or wall. I’d like to share my bhindi (okra) masala recipe with you, but despite using the same ingredients for a lot of my curries, they never taste the same each time. 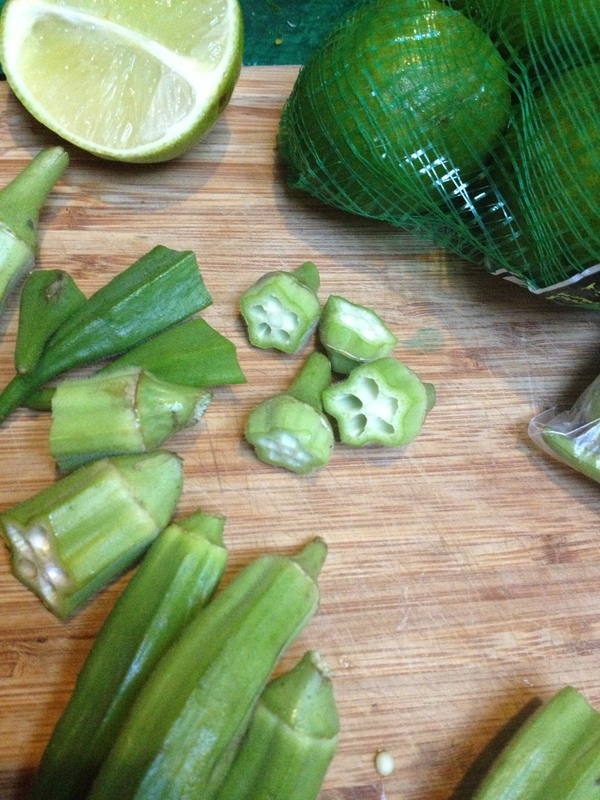 Instead, I’ll point you to some recipes for okra, you’re sure to love. I just want to give Wendy of AskWendy a big THANK YOU for posting a link to this year’s Epeolatry Contest. Not familiar? There’s still time to get your 600 word entries in! Free and open to all ages. Details here. Check out AskWendy for information on writing contests for both adults and kids. She posts everything from small contests like mine to ones from big name magazines and presses with large cash prizes. Thanks, Wendy! A short story contest for our kids. Get writing, and good luck! Seattle Aquarium just published an ebook available for free either for your ereader or as a .pdf. As a fan of otters, this is an especially adorable book dealing with self-doubt, and includes both charming illustrations and real life video clips from the animals at the aquarium. Mmm . . . now I’m hungry for a cake made of sea urchin, clams, and crab. Nom! Last year, inspired by a list of obscure words being removed from one of the major dictionary publishers, I held a short story writing contest for anyone who wanted to participate. The deadline was my birthday, and three handmade prizes were awarded to the winners. It was so much fun, I’ve decided to do it again, and in order to encourage more entries, I’m posting it here. This is an all ages contest (if you have budding writers in your homeschooling experiment, this might be fun for them), purely for the enjoyment of the exercise, and the full details can be found at my LiveJournal page. Brush up on your iambic pentameter, because this year I’m accepting both 600 word short stories AND sonnets from eager epeolatrians.
. . . and I really need to make a banner or official image for this contest. The Golden Apple captivates viewers with its xanthic radiance, but what, pray tell, does it have to do with writing contests or the word epeolatry?